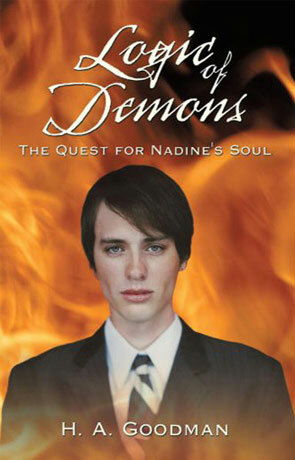 Logic of Demons: The Quest for Nadines Soul is a contemporary fantasy novel by H A Goodman. Devin's life has been ripped to pieces, his wife raped and murdered while still carrying his unborn child, revenge is the only thing that drives his continued existence. He listens as his father-in-law counsels against anything rash, anything that could be regretted later, but his hatred and despair overwhelm any real sense of reason. Driven by the angry voice in his head he succumbs to violence becoming a vigilante. He beats his wife's murderer to death. Crashing in to the horrific scene, the police interpret Devin as a threat and open fire, killing him instantly. Within days of his wife's death, Devin finds himself joining her in the afterlife - but they haven't been reunited. Devin belongs to the Company now, apparently, and his only chance of seeing Bridget again is to sell a mysterious Formula to a living girl he's never met. The novel is written in a very simple, uncluttered manner which is both easy to read and enjoyable, and the pace is enough to keep the reader interested. Even though there are many serious themes running through the book there is a very light, tongue in cheek humour which is quite refreshing. Despite this uncomplicated structure, Logic of Demons is a much deeper novel than first appears, while it has a rather nieve and somewhat dim witted protagonist the novels main themes of sociology, religion, the human condition and the whole afterlife question are covered with a great deal of sensitivity, thought and intelligence. The plot is also significantly more complex than the writing style would suggest with plenty of twists and turns to keep you guessing just who are the good guys and who the bad and this extends to the great ending that will leave many a reader completely unsuspecting. The protagonist Devin is clearly a flawed character, he really isn't the sharpest knife in the drawer and appears at times far too trusting and unsuspecting and this not only makes a nice change from the perfect hero that features in many novels but also allows the story to really develop from Devin's many mistakes and poor choices. There are times though that his decisions really do make you wince, like the character in the horror film deciding that it's a good idea to investigate that scary sound, in the dark, alone, with no weapon. What the author manages to achieve is to get you thinking about the big ideas and serious issues without realising you are actually thinking about them. Logic of Demons: The Quest for Nadines Soul is an easy reading, light hearted novel that manages to convey some important ideas without damaging the twisty story, with a very original plot and amusing characters, recommended. Written on 11th December 2010 by Ant.